The crew accommodation is for 4 crew members in 2 cabins. This classic canoe stern Benetti was purchased 2 years ago by the present owner, who did a complete reconstruction of the yacht. During the rebuild, the whole interior (including machinery) was removed, the steel hull and the aluminium superstructures were measured for structural density and rebuilt where necessary. The complete interior was redesigned and rebuilt to a Frederic Mechiche design. All machinery, electronics and wiring is new from her 2005/2006 refit. 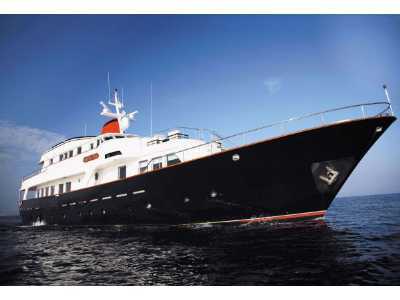 - The Owner’s cabin is located on the upper deck, adjacent to a private aft deck. - A large sunbathing area is located on the top deck. - The main salon is extraordinary large for a yacht of this size. HAPPY DAY is considered as a new vessel with very few running hours on her new engines and generators, which makes her the highest quality and ‘newest’ classic yacht in her category. She is very seriously for sale as her owner is already involved in another, larger project.